This is a leaflet for Jeye's disinfectants. 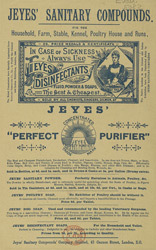 John Jeye developed a strong disinfectant in the 1870s, as a response to the poor social conditions of the time. Poverty, disease and pollution were widespread and a good disinfectant could be used to stop the spread of these conditions. The medical profession started to use Jeye’s disinfectant because they discovered that if swallowed by a patient by accident, there were no ill effects.